The Hasbro US (and Japanese) bayonet has been widely reproduced, both as knock-off-items in the 60s and 70s, and as modern forgeries or 'reproductions' today. The example shown above is the one way to be entirely sure your bayonet is authentic: only buy examples on originally sealed 1960s cards. If you haven't read it already, the best place to start understanding bayonets is with an article written in 2004 by Dan McKee. Titled "Basics of Collecting Vintage GI Joe-Bayonets" it outlines the details of original pieces and how to tell originals from some reproductions. Images and comments shared here are supplementary to that article. Click on the button below or article title above to read the article. Since Dan posted the above article back in 2004 there are a few more details that can be shared. Images and caption below will help you identify your bayonet. Above, note the difference in sheen of the handle paint. The glossy version on top is a standard issue Hasbro bayonet. Below it, with a matte grip, is an early bayonet from a group of salesman's samples. It is thought that the matte grip is is the sign of the earliest Hong Kong bayonets. Also note the generally crisper molding detail. The bayonet is. after all, an accessory for the rifle. 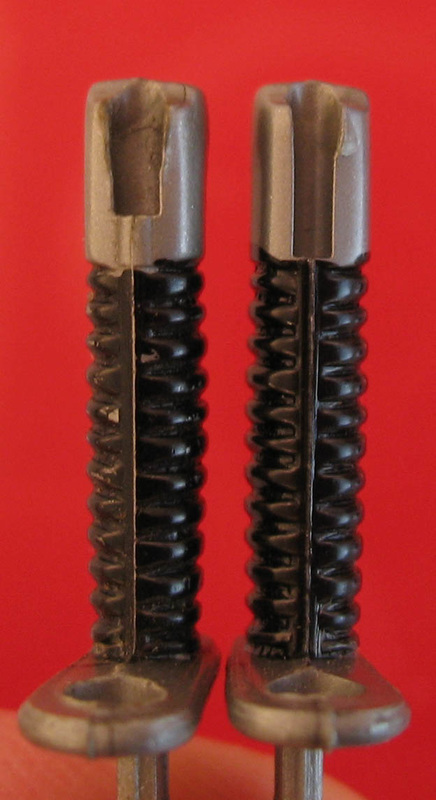 Below left, note the variety of bayonet lugs on Hasbro M-1s. From top to bottom, a small lug on a Hasbro Japan 'R' with indented script, The long lug on a M-1 simply marked Hasbro 'R,' the mid sized lug on a Hasbro Japan 'R' with raised lettering, and the long lug on a rifle with the raised mid-stock Hasbro Japan mark. This last rifle would have come with the Japan marked bayonet shown at the bottom of the page. Looking at the guards and receivers on these two bayonets, note the variation in size. 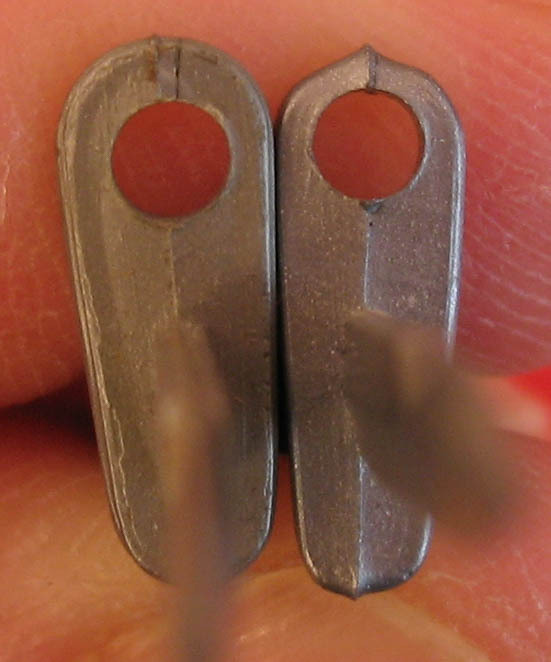 The guards can be wider or more narrow, and the receivers short or long. While the size of the guard seems to vary, the receiver size corresponds with the size of lugs on the rifles. If you have ever had a bayonet that is a loose fit on your rifle, it it likely because it was designed for an M-1 with a different size lug than the one you are using. 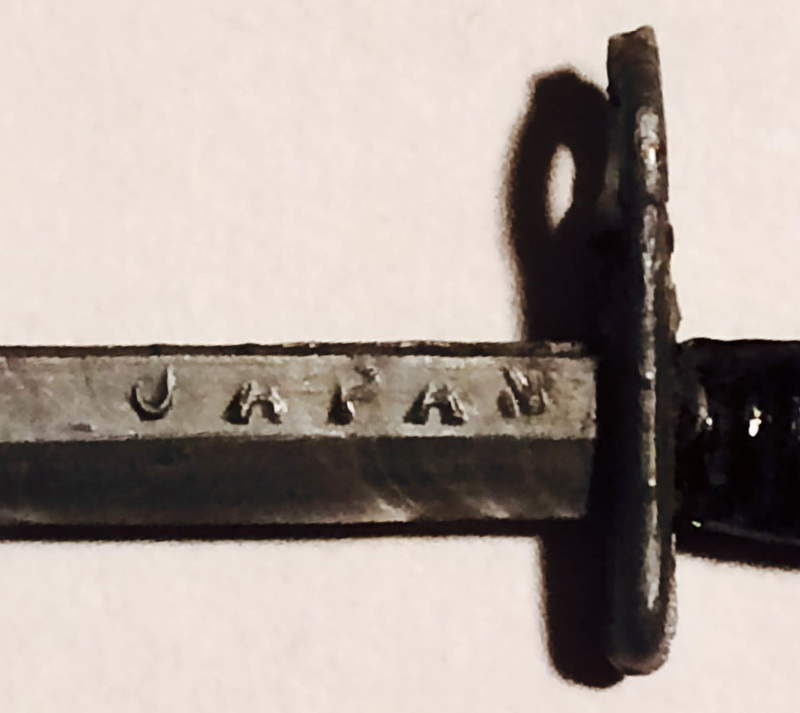 The Japan marked bayonet is a rare and early piece, following the matte handled bayonet. As sales ramped up early-on, Hasbro struggled to meet orders and began manufacturing some items in Japan as well as Hong Kong. These pieces, though early and tough to find, were not initially of as high quality as the Hong Kong pieces. The M-1s were chunkier and have the mid-stock marking that can be seen on this page towards the bottom. Their accompanying bayonets are very tough to find. the example shown here was graciously shared from the collection of Terry Akin.